Changes: Added more cheats addresses and values. All C.A.P. Addresses must be locked (click the box next to it so it has an x) then exit the C.A.P. editor for the changes to work. C.A.P. Weight 197 = 197lbs. How to use: Place the .exe file to NBA 2K13 installation directory then create a desktop shortcut. 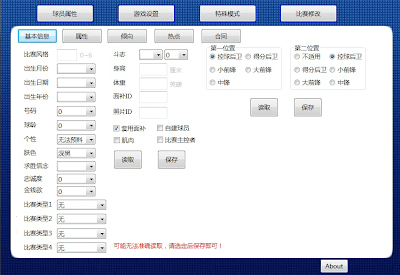 You must also run this NBA 2K13 Trainer as administrator. Note: You must have enough skill points to make at least 1 purchase from any attributes. 3. Go to MyCareer > Player Upgrades > Attributes. 4. Write down your current total skill points (SP) located at bottom right corner of the screen. 5. Minimize NBA 2K13. (Alt + Tab). 6. 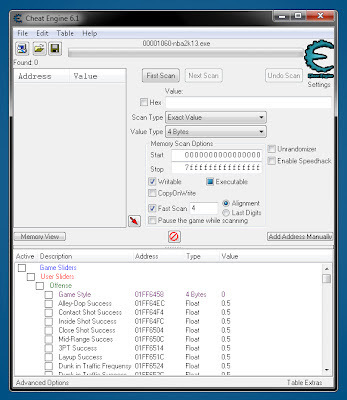 Open Cheat Engine and select nba2k13.exe on the process list. 7. Enter your current skill points in the "Value" input field then click "First Scan"
8. Go back to NBA 2K13 and purchase any attributes. 9. Again, Remember the value of your current total skill points (SP) located at bottom right corner of the screen. 10. Minimize NBA 2K13 (Alt + Tab) then go back to the Cheat Engine program. 11. Enter your new skill points in the "Value" input field then click "Next Scan". 12. After scanning, you will see 2 results on the left side of the cheat engine, double click both of it. 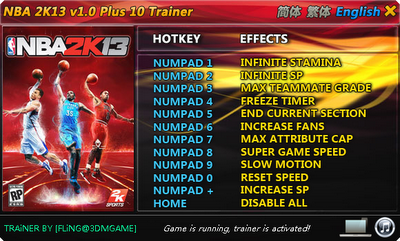 Description: This includes SP, C.A.P., Coach Settings, Sliders, Game Options, and Attributes. Note: You must have Cheat Engine downloaded already, Run NBA 2K13.exe then open Cheat Engine. 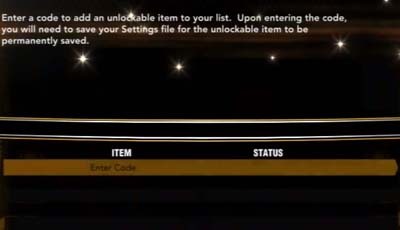 Click the computer icon under the "File" Tab, and select the NBA 2K13 process. Click Yes to load the NBA2K13.CT table. 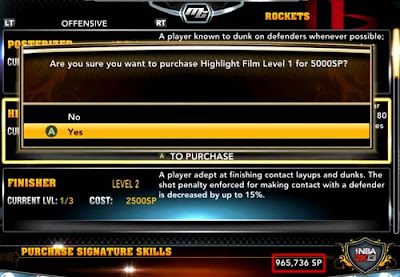 It is recommended that you go to options in 2K13 and play around with the options to learn what each address does, then you can freeze the values by clicking the boxes next to address, to keep the settings for MyCareer. Go to the NBA 2K13 main menu, select the "Features" option, choose the "Codes" option, then enter the code listed below to unlock the following NBA 2K13 features. The available codes works for XBOX 360, PS3 and PC version of the game. NBA 2K13 Codes / Unlockables spriteeffect - Enter the code "spriteeffect" and get +3 ball handling skill points for your NBA 2K13 My Player. underarmour - Enter the code "underarmour" to unlock the "Under Armour Torch" shoes. payrespect - Enter the code "payrespect" to unlock the ABA ball. The codes below are only valid for the console version of the game. mwpzoslqov - Enter the code "mwpzoslqov" to unlock the NBA East and West All-Star 2013 jerseys. mnspxuwmdy - Enter the code "mnspxuwmdy" to unlock the NBA Christmas uniforms. kqpxmzodqb - Enter the code "kqpxmzodqb" to unlock the Miami Heat's White Hot uniform.